Let alone strategy, you’ve never even stepped foot in the doubles court. But if you are curious and adventurous enough, doubles squash is one of the most exciting games you can play. Doubles squash is a fantastic game to play. Similar to other racquet sports like tennis, doubles squash is played with two teams of two players. But, with squash all four players are mixed together in a single court area. The actual court area is larger than a singles court, but with a hard ball traveling very fast and bodies constantly moving, this sport can make a very exiting game. The basic principle of how to play doubles squash is to have two teams that are made up of two players each. The teams are split between a left wall player and a right wall player. It is the responsibility of each player to cover their side of the court. However, you do not have to remain on one side of the court and can freely move across to the other side to help your partner if necessary. 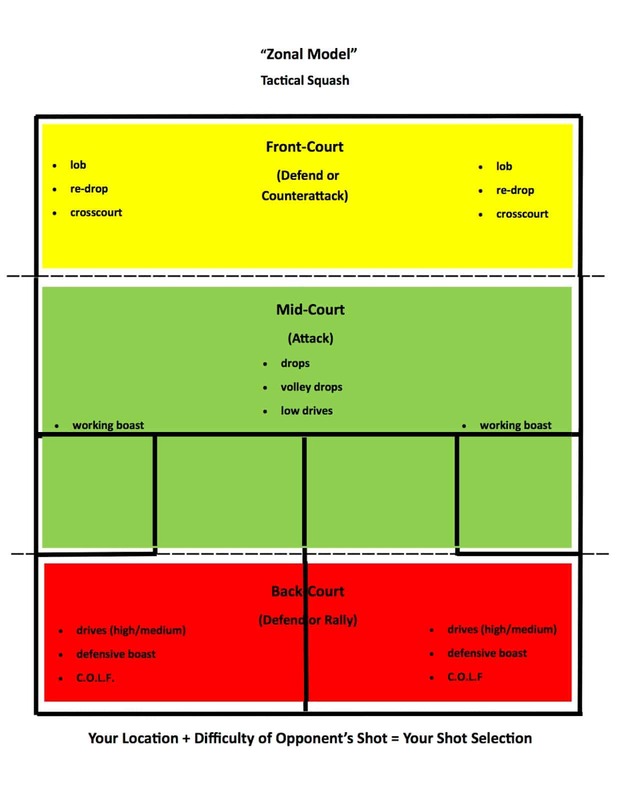 In the fast-paced action there is a high chance of switching court sides while playing a point. In doubles squash the striking of the ball alternates between the teams. As long as the two teams take it in turns taking a shot it does not matter which team member is playing the shot. For instance, it is perfectly acceptable for two players from different teams to play out a rally on one particular side of the court. The other two players won’t simply be standing still but jostling for position in the event of the squash ball falling to them. The process of scoring in doubles squash is based on playing the best 3 out of 5 games. Each of the games played is up to 15 points. If the game reaches 13-13, the first team to arrive at 13 has the option to select one of three numbers – 2, 3, or 5. The chosen number will be the extra points needed to win. For instance, if a team picks 2 points then the game continues until one team wins the extra two points. In the event of a 14-14 tie, the team to arrive at 14 first is given the option to win by either 1 or 3 points. Squash is unlike other racket sports, there is no need to continue playing until one team gains a two point advantage. 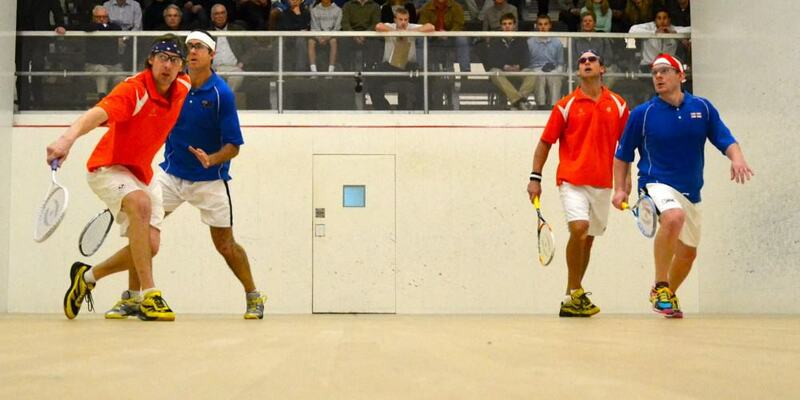 Lets are likely to be a common occurrence in a game of doubles squash. In most casual games, the preferred option is simply to repeat the play in the event of the unintentional interference. 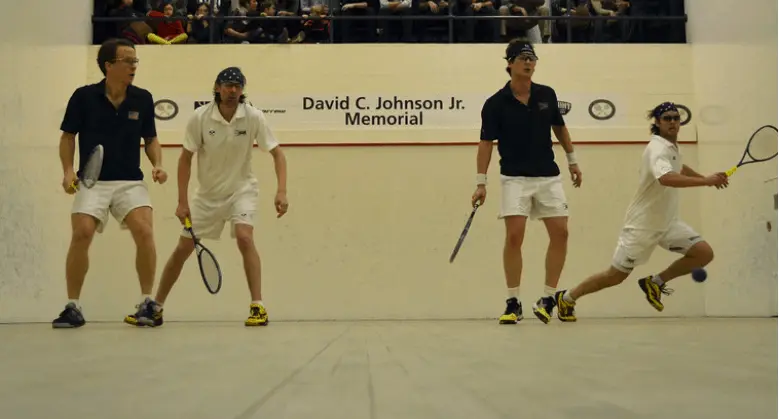 With four players in the confined space of a squash court, the play can get frantic and there is always the risk of a player getting in the way. 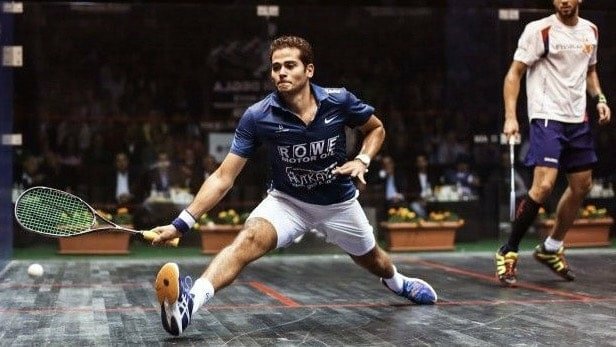 Surprisingly, squash players seem to forget the importance of the serve as it relates to overall doubles squash strategy. While it is nowhere nearly as important as serves in tennis, varying them always keeps your opponent off-balance. Even if you have a great serve, it becomes more effective when mixed with a few variations. When playing doubles squash, how you start the serve and how you return the serve can set the tone for the game. Properly executing either of these fundamental shots can help set your team up for a successful outing. Sometimes, this is enough for you to win the game. There are four different attacking serves. Hard serve straight to the back-wall nick. Vary your serves so your opponent does not get into a groove. By keeping them uncertain, it allows you to execute your strategy. When returning the serve, be cognizant of the shot placement because you do not want to leave your teammate out of position! To return serve, stand one step’s reach to the side wall. Any returns of the serve hit down the wall should be hit really low or really high. This is so the opponent cannot block you out and attack the front corners. Always have the racket up and stand with your weight on your toes and with knees flexed. That way, gravity helps you go to the front wall with a quick first step. The game of doubles squash can be a fun-filled sport that is very action-packed and exciting. Good Partner – a basic rule of playing doubles squash is to pick a partner you are familiar with. Plus, it benefits to get involved in regular practice sessions with your partner to learn how they work and the type of shots they prefer to play. Once you understand your partners play and movements you are in a better position to know where to place yourself on the court to receive the counter-shot. Corners – the squash court has four corners and only two players per team so this makes it difficult to cover all areas. The ideal strategy is to attempt to split the opposing team and look to strike the ball in the direction of one of the open quadrants. Setup shots – try to take the deep shot before you look to take the short shot. Try to attack crosscourt to improve the ability to open up the court area. Target the weaker player – make sure to play the shots that target the weakest member of the opposing team and be ruthless in your actions. Minimize unforced errors – If you watch the pros play, you will realize that there are very few unforced errors in a game. They don’t serve out of court, nor do they hit tin after setting up a perfect kill shot. You may have to remind yourself that keeping the ball in play is half the battle. Use attacking shots – one of the favored attacking shots in doubles squash is the reverse corner. This will make the opposing team play a shot cross-court to your teammate who should be ready and waiting to return with a volley. It isn’t possible to put a shot down the line because this can lead to a stroke call. Go for the volley – a simple doubles squash strategy is to go for the volley whenever possible. This is a basic rule for winning a game of doubles. Many opposing teams will attempt to push you to the rear wall, but don’t willingly let this happen. Cover multiple shots – if you are defending you want to consider a range of shots. Don’t just think about the shot that will continue play, but also the shot that could potentially beat you. Vary the gameplay – change up the gameplay every so often and attack down the middle of the court on occasion. Also, you can look at varying the direction and height of the ball. 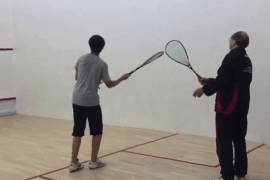 Blocking the ball – in the event of the squash ball being struck directly at you, the best action is simply to block the ball using a fore-swing. There is no need to take a full swing or a back swing. Warm-up – before getting into a match, it is essential to do the basics. This means preparation and warm-up, such as practice serves, speed volleys and stretching. Communication – a simple doubles squash strategy is to communicate and talk with your partner. It helps to plan and be aware of the type of shots that you intend to cover for each other. A team with a plan in place is certain to be that much more successful. Call your lets – It takes you awhile to realize that you can actually win points in a squash game without actually hitting the ball. Not calling your lets would simply mean that you are playing from a point of disadvantage – like playing a shot with only half the front wall available to you. The Right Racquet – if you get serious about playing doubles, you will also want to have the gear the pro’s use. A round, heavier racquet is preferred for doubles play. A great option is the Harrow Vapor or the Harrow M-140 . If you don’t like the price point, the Dunlop Force Rush racquet is a great option too. The Right Gear – With the fast-paced action on the squash court it is worth investing in a decent pair of shoes and goggles. For shoes, consider the Salming Kobra Shoes or the Head Sprint Pro . Goggles are even more important to wear during a doubles match when a lot more is going on. There is plenty of movement on court and with the ball constantly moving fast you want the necessary protection in place to protect the eyes. A great option is the Tecnifibre Absolute Eyewear that provides a little extra comfort on the court or the HEAD Pro Elite Eyewear . There is more of an emphasis on crosscourt shots vs. battling it out on the rails. In singles, there is a tendency to avoid hitting cross-courts as they can open up the court to your opponent because in singles it can leave you exposed because you did not recover back to the T.
In doubles squash, the court is so much bigger than in singles squash that there isn’t the same need to recover to the T. Moreover, even a good straight drive from the back of a doubles court will probably be cut off and put away short to the front, which can be a costly way to give up points to your opponent. In doubles squash, a ball hit to the front of the court doesn’t even need to be that good to be a winner, because your opponent is starting from such a long way away from the front of the squash court than in singles. If you are stuck in the back, the smart shot is to hit crosscourt. That’s not always an option either so the skid boast, usually a terrible shot on a singles court, is your best bet and—if played well—will get you out of trouble. In doubles squash, the dominant court position is maintaining position at the red line. This is the equivalent to controlling the “T in singles. Plus, in doubles squash you can attack more than in singles squash. A good doubles player should hit 70% of their attacking shots. While playing doubles squash, the primary attacking shot is a reverse corner and straight (cut) drop shot. To hit this drop shot, you cut or “chop down” on the ball and aim to have it come off the front wall towards the side wall. You do not want this shot left in the middle! The last point in doubles squash is to learn to let the ball go and trust that your partner will cover for you. Rule number 1 in doubles squash is to have a good partner. Rule number 2 is to not let your ego get in the way. A good cross-court shot will break high at the wall just behind the red line, making it a difficult shot to volley off the wall. But because the ball is coming with so much speed, oftentimes a more advantageous shot can be made by letting the ball go and having your partner hit the shot from the back middle of the court. 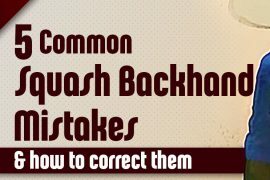 This is not an easy skill to learn, but it is what separates the A doubles squash players from all the rest. This builds upon the above with some additional points on doubles squash strategy from Peter Briggs, with an infographic we have made of his points as well. Here we go! Always hit deep before you shoot short. If your opponent is in front of you, do not try and hit a drop shot! Volley every ball you can touch! This is the Golden Rule of Winning Doubles. If the opposition’s strategy is to push you to the back wall, don’t go willingly. VOLLEY! There are four corners in the court and only two people on a team. The simple goal is to split the team on the diagonal and hit to one of the open quadrants. The number-one attacking shot is the reverse corner. Your opponent usually has to play the ball back cross-court to your partner and they should be ready to attack on the volley. To open up the court, attack cross court. For cross-court shots, aim high and hard at your opponent’s shoulders. The second spot is at there knees. Vary the height, speed, and direction of your shots on the front wall. Move laterally on the red line, not in a box step, when rotating with your opponent. This allows you to not get blocked out. When rushing to the front of the court, play fewer drops and more lobs to allow you to get into position as well as attack a corner your opponent is not in. If you are defending, cover the shot that beats you, not just the shot that continues play. When defending a ball hit hard at you just block the ball with a fore-swing, do not take a backswing or full swing. If you do you will hit the ball out of the court or miss altogether. Don’t use a singles racquet on the doubles court! The leading racquet maker for doubles is Harrow, with a great option being the Harrow Vapor racquet. If you don’t like the price point, the Dunlop Force Rush racquet is a great option too. We also have our own guide to racquets that are available. In doubles squash, the variability of play can be dramatic. Playing requires a good partner, shot selection, court positioning, and footwork to contribute to your strategy. This, in turn, impacts your doubles squash levels. The biggest thing C players can do is to play defensively and work on getting their opponent in a position of weakness, versus going for an early point in the rally. They should also focus on fundamentals: cross courts that hit the side wall, using the height of the court to lift the ball over their opponents, and hitting to the frontcourt when the other team is behind them. C players should also start being more aggressive with their first serve, and get in the habit of volleying the serve return to avoid getting into trouble with the back corners. Players learn positioning on the court and when to rotate with the other team so they are in a position to play the correct shot. This is also time to experiment on both walls, getting more comfortable as you gain experience. B Players begin using the reverse corner and the three-wall more effectively. They are able to adjust to different styles of play, such as high-pace or shot-making. B players should look to use their serve and return as a weapon, as they are confident to volley at any time. Crosscourt shots for B players are difficult for opponents to hit before hitting the side wall. Players are more efficient with movement by allowing the ball to come to them instead of overrunning. B players start to think strategically, like isolating a weaker opponent on the opposing team. Players naturally cover for their partner when in trouble and even change sides if necessary. A players volley easily and can make drop shots deceptive because they don’t change their racquet speed and use different spins on the ball. They let a wide ball pass them for their partner to hit, and then cross over to the side wall comfortably when a ball goes to the back. They defend and anticipate their opponent’s attacking opportunities due to positioning (technique and footwork), along with their shots (lobs and skid boast). Crosscourt shots will break on the side wall at different heights, speeds, and angles. They have a clear understanding of who will play a ball in the middle of the court without verbal communication. They have an advanced court sense and are generally aware of the positions of the other three players. Thus, points are earned by moving opponents out of position. So, you can’t round up 3 other people to get in the court with you. We’ve all been there. After texting and emailing all your friends (and the jerks too), you are left to what you had always hoped for: solo squash doubles practice! Squash provides the ability to achieve meaningful practice on the court by yourself. You can practice all the shots you might hit in a match in almost the same conditions and at the same pace and energy, you’d normally hit them. For hardball doubles, there is a misconception that you always need four players to play. But, there is a lot you can do on your own. 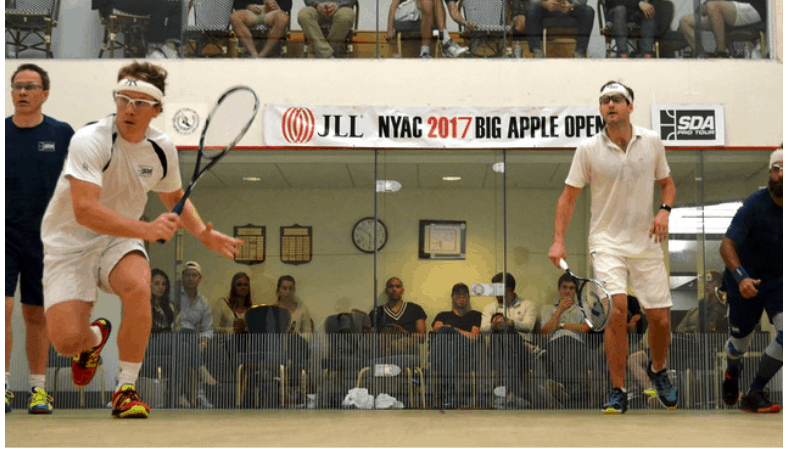 Solo practice is a critical part of improving your doubles squash strategy and game, just like it is for your singles game. Go to the T and try hitting volleys to yourself. Aim high above the service line and hit soft enough so the ball comes back to you at shoulder height. First get comfortable doing straight volleys, then move across the T with crosscourt volleys. Try hitting straight deep drives to yourself on your regular wall. Aim for the back nick. It’s harder than you might think. A good goal is to hit 40 in a row. Mix in a few low kill drives as well, keeping the ball tight to the wall and bounce it twice before the short line. Position yourself to either side of the T, just in front of the short line. Hit the ball to yourself just above the service line, then hit a reverse corner to the opposite front corner. The ball should hit the side wall than the front wall just above the tin. If you hit it right, the ball should roll or bounce back close to you. Feed again and repeat. Also, try the same exercise hitting the front wall first and aiming for the nick. Start off in the back corner of your normal side. Hit a deep drive that bounces off the ground just in front of the back wall. Hit a three wall boast (side wall closest to you, front wall in the opposite front corner, and then hopefully close to the nick). Again, the ball should roll back close to you and repeat. For all your doubles solo drills, perform them on both the forehand and backhand. Even if you normally only play matches on one wall. It will balance your game and help prevent overuse injuries from always doing the same thing. Plus, you can be a jack-of-all-trades and get more squash in! We have other articles that will help add to your doubles squash game focused on racquets and shoes.